I was waiting to get a chance to play this one before discussing it, but then I realized that I would get bogged down with other modules still waiting in the wings. And, really, have I played through all of Barrowmaze yet? No. So better to just hop to it! I picked up People of the Pit by Joseph Goodman at the same time that I grabbed Sailors on the Starless Sea, and I gave them both a good (avid!) read-through almost immediately. Spoilers will, of course, ensue, so if you are going to play through this module, do yourself a favour and skip to the next blog. When you take a look at the basic cover of the core DCC rulebook, and see that adventurer staring at a door across a mist-wreathed chasm, you might as well be staring at the genesis of People of the Pit. If that image stirs your soul, this module will as well. And the cover to the module? It downplays what you are facing. Considerably. People of the Pit pits the PCs against a cult of degenerate humans that worships a great tentacled monstrosity living in just such a mist-wreathed chasm. How big are these tentacles? You can ride or crawl down them to get from one level to the next. How degenerated are the cultists? Depends upon how high in the hierarchy they have climbed…and bold PCs gain the opportunity to risk some of that degeneration themselves. I noted what I believe to be nods to H.P Lovecraft, Robert E. Howard, and Roger Zelazny ‘s Amber series, and I am pretty sure that there were other nods that I missed. The climactic encounter could well have appeared in a novel by Abraham Merritt. The module drips Appendix N flavour. A wand that can be found herein was influential on my version of the create wand spell that appears on this blog and in Crawl! Fanzine #3. It is part of a very nifty encounter. The map itself follows the theme of entwined tentacles rather strongly, and is pretty evocative. I am imagining that most players will “get” this, either consciously or subconsciously, as they try to navigate the spaces they are exploring. Joseph Goodman includes magic teleport pods that allow characters to get from one place to another within the complex. These pods require a spell check, and I admit that I was a little puzzled by them. Goodman notes that anyone in DCC can make a spell check using 1d10, and it is nifty to include something in the module that allows players to make use of this rule. But what is the penalty for failure? Do you get to roll until you succeed, or is there corruption on a natural “1”? Is there a limit to how often you may try? I get the feeling that different judges will have different answers to these questions, and that seems perfectly fine to me. 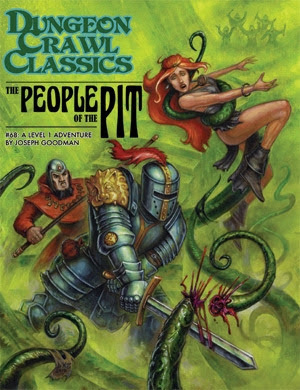 People of the Pit is also interesting as there is the chance to incur a loss of Luck, a strong part of the implied setting from the core rulebook, but not often used in adventure creation to date. There is also an NPC trapped in the area being explored that can be used as a replacement PC. This is a good provision, as the module is deadly, but the enterprising judge may wish to prepare a character sheet using the Purple Sorcerer Tools so that the new character can jump right into play. Judges interested in bringing patrons into play should also consider this module. Although there is no patron write-up for the great tentacled beast…but there could have been. You do get two new spells, and you certainly do get some creepy-good ideas. Not every patron should be PC-friendly, or something that you’d want to take home to meet the folks, and this should definitely remind the players to be careful about who (or what) they make alliances with, if they would not like to end up like the cultists. There are a lot of imaginative bits in this module, and it is one that I recommend. I’ll be talking about it again, I feel certain, when my players have gone through it. The module is very deadly, with some encounters that could certainly decimate the unwary or the unprepared, but adventurers who are clever, mostly cautious, but bold when they need to be, and lucky to boot should do well. Certainly the players will have had an experience that they will not soon forget. This is not Joseph Goodman’s best module to date – in the DCC line, I’d say that’s a toss-up between The Emerald Enchanter and The 13th Skull, both of which are cooler than a frozen penguin on ice – but it is a very, very solid 1st level adventure. That I think the other two are better is a testament to how good they are, and is not a knock against People of the Pit. I am looking forward to running this one, and give it a big thumbs-up! >in a novel by Abraham Merritt. I guess the adventure is loosely based on Merritt's short story of the same name.